A big, red apple  surrounded by rouge pots, pencil and puff for eyebrow and cheek  sat on a star's dressing table. Outside the rhythmic recall of an actress before the curtain attested the audience's approval. The clapping rose and fell, mingled with cheers, finally lingered and fell. 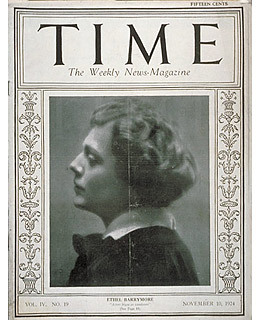 The dressing-room door swung open and Ethel Barrymore appeared, beautiful, a little tired perhaps, excited and again successful...Read the full story.